Christmas Miracles at the Little Log Cabin is a lovely festive read from Helen Rolfe. It’s actually the fourth book in the New York Ever After series although I haven’t read any of the previous books. I think I would have liked to have known more about the other characters who were mentioned just to add to my enjoyment, but I was certainly able to read and enjoy this story as a standalone. The story begins when Holly who has recently gone freelance as a magazine feature writer, goes to to photograph her boyfriend’s new hotel in Inglenook Falls. Falling and banging her head, she is rescued by the reclusive Mitch who takes her back to his log-cabin to recover. Mitch runs a Christmas tree farm which is at its busiest of course at the time the book is set but he really needs to work on his people and business skills! Over the next few weeks, their paths cross quite a few times, sometimes by accident, sometimes by design. What I enjoyed most about the story was finding out about Mitch. He was such an interesting person and you could understand how his past relationship and loss had turned him into this reclusive person. His past hurts made it difficult for him to open himself up and trust people. Holly though, just seems to have that special something which might melt his heart but, with her already being in a relationship, could she ever feel anything but sympathy (and sometimes irritation) for Mitch? I loved watching Mitch’s character begin to open up throughout the book as he began to understand that people could actually care for him. Helen Rolfe’s descriptions of a festive New York and snowy Inglenook Falls were lovely and conjured up a really Christmassy picture in my head. The Christmas markets sounded like somewhere I would love to visit, the decorations both in the city and the town sounded wonderful and oh how I would love a proper white Christmas! Inglenook Falls sounded like a great community to be part of, so friendly and with lots of supportive residents. 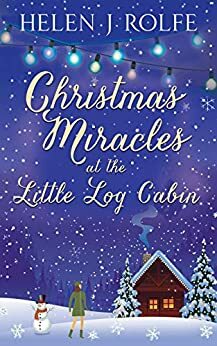 Christmas Miracles at the Little Log Cabin was a sweet festive read and yes, deserving of the phrase ‘heart-warming’. Having got to know a little about some of Holly’s friends in this book, I’d be keen to read more about them in Helen Rolfe’s other books in the New York Ever After series.